Center Jack Miller had a rough game against Central Michigan on Saturday. He was spun around by a defender, missed a block, found himself dangerously close to being illegally downfield on a 36 yard passing play and contributed to an illegal procedure penalty when the offense took off prior to his snap of the ball. And that was just during the first quarter. 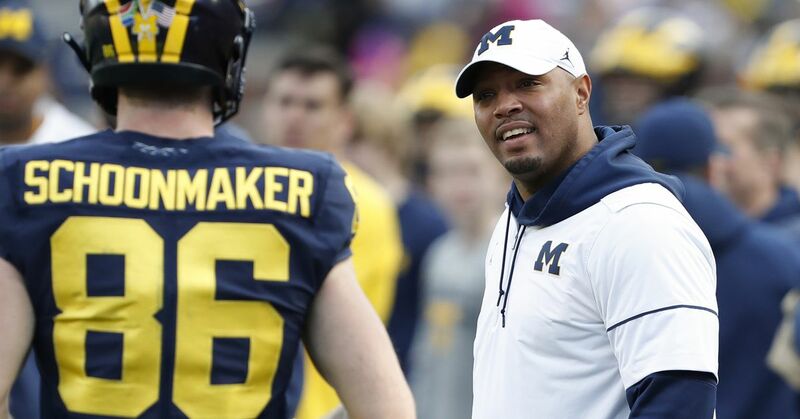 Despite these mistakes, the Wolverines still managed to score two opening quarter touchdowns on the way to a 59-9 thumping of Central Michigan. Scoring 59 points would seem to indicate that the Wolverine offense had no problems on Saturday. But the Wolverines didn’t deliver on their preseason promise of a return to power football until the game was safely in hand during the second half. The Wolverines have revamped their interior offensive line with Miller at center and Graham Glasgow and Kyle Kalis at the guards joining returning starters Taylor Lewan and Michael Schofield at the tackles. …Nix has no shortage of raw power. He frequently takes on opponents straight on and drives them into the backfield. His ability to truly overpower offensive linemen with his leverage and strength stands out even against collegiate competition, and it gives him the ability to be a force on the interior defensive line. Nix poses a formidable challenge to first year starter Miller. Heading into Saturday’s game against Notre Dame, Hoke needs to evaluate whether Miller’s struggles were just opening game jitters or indicative of a larger problem. A few mistakes against Central Michigan didn’t hamper the Wolverines from scoring 59 points. In 2011, the Wolverines needed an epic late 4th quarter comeback to beat the Irish 35-31 during the first night game in the history of Michigan Stadium. Last year the Wolverines self-destructed in South Bend turning the ball over 6 times in a bitter 13-6 loss. With Notre Dame having backed out future meetings after next season, the Wolverines want to avenge last year's defeat. But they'll need a much better performance from their offensive line to do it.